Spain back with their 30 minute English segment today, Wednesday, December 26th. It was pre-empted by live Christmas Eve programming on Monday. Hopefully not will soon be a 7 days a week segment, with the return of the mailbag. Tuned in at 2003 to hear renditions of O Come All Ye Faithful and We Wish You A Merry Christmas. 2011 Off with no announcements. Fair but steady AM signal S-5. 0324 It Must Have Been Love - Roxette S-8 Audio somewhat overdriven. 0327 Pre-Recorded ID, email by OM with English accent. 0411 Sign Off - thanks for the Great Christmas Show Captain! 0305 Another tune ... too weak for Shazam now. No announcements, steady S-6 carrier, audio pretty good. Someone under CFRX at 2125 playing C&W tunes .... Ideas? Skipper thanks .... forgot about the German! Probably them. 0208 Talk by The Crusher!!! 0213 Prank phone call .. funny! Tuned in 0115 ... great signal and audio tonite! Nice to have the band behave every once and a while. 0157 quick fade to nothingness. Great show BID! 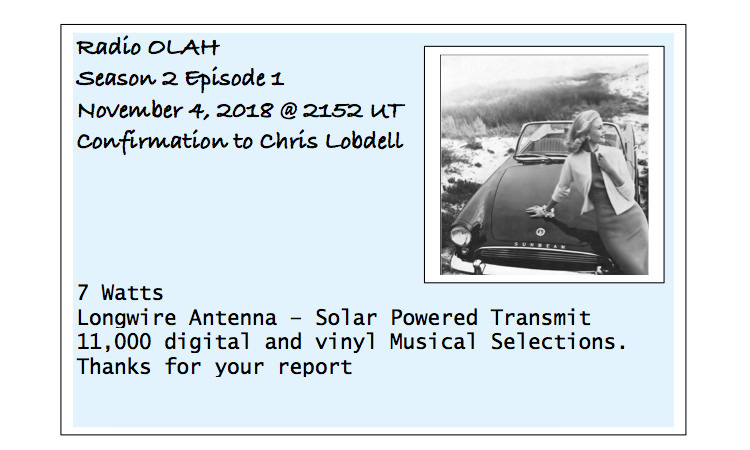 Received this nice eQSL from them this AM! Thanks guys! Thanks for the advice Chris S.
2157 I think it's "Hola" per the ID at 2157?? 2207 "Teenage Kicks" by The Undertones. 2219 ID and off with email "radioolah@gmail.com"
Shortwave Broadcast / Re: REE ***ENGLISH*** 9690 am 2300 utc 31 OCT 2018 They Have Returned!!!! Today 11-3 sounds like they are talking about soccer. S-9 +20 some fading Thanks CT! for the info.